With the next best gun priced at £400 more than this price tag, Rupert Blackwall would take a serious look at the inertia-operated Marocchi SI 12. One gripe is the "golden chickens" engraved on the side of the blacked action. Stick to scrolling! This Marocchi SI 12 semi-auto, supplied by Viking Arms, is a gun that has had very little press in the UK – it should have, though. The company was founded by Stefano Marocchi in 1922. In the early days, the business made high-class components for side-by-side guns, then in the late 50s made an early cO2 operated semi-auto rifle, after which an over-and-under was developed, with which one of the family members had a a lot of success with at the European Clay Shooting Championships. With these developments the company started to be more diverse, not only in what it was producing, but the technology it used in these areas. In 2007, the company obtained a European quality certification, which it earned from its engineering skills. In 2008, Marocchi had the contract to distribute Breda goods/arms. With that, it started to develop its own inertia-operated semi-auto system, which is when the SI series was born. The company produces 95 per cent of this gun in house: only growing the trees used for the stocks aren’t part of this. Marocchi prides itself on the materials it uses – time will tell if this is justified. Viking Arms supplied me with a 12-bore grade 1 wooden stocked version of , giving a good first impression – it certainly made me want to know more. At a first glance this Marocchi SI 12 semi-auto looked like it was finished to a good standard. The blacking was crisp with the bolt and other components mostly chrome plated, helping to make the action slicker. The inertia-operated mechanism is very similar to the Benelli style one. The trigger-plate is made of a high-grade plastic, which is no different to most other semi-autos on the market. One gripe is the “golden chickens” (pheasants) engraved on the side of the blacked action. Stick to scrolling, is my advice! The model on test has a barrel length of 28in with five long 90mm multi- chokes. The bore measures 18.5in and is chambered at 3in. There are other barrel length options: 24in, 26in, 28in and a 30in. The Marocchi SI 12 barrel profile has a 7mm diameter vented rib, with tramline lines running down it to reduce light reflection. Machined dovetail slots on top of the action would allow for a scope or an Aimpoint sight, though this is more aimed at the Continental market, where the use of slugs is fairly commonplace. The stock on this gun, being grade one, is nothing to write home about, but crucially the grain runs in the correct direction. The first thing I noticed when mounting the gun was the stock length (14⅝in to centre) to be of a decent length. The drop at heel is 2¼in and 1⅜in at comb, with the cast 3/16in off, all sensible measurements. They certainly allow you to see some rib, rather than the back of the action, which is a problem with many semi-autos. Marocchi does offer various wood grades, as well as a synthetic option, which would be very practical for the UK market. The stock shape is fairly conventional apart from the full pistol-grip. I found this a little too full and it could it do with coming back a bit. I think it would help for the majority of shooter’s hands, especially if they are on the larger size. The fore-end shape is a slim beaver-tail; with a single flute each side allowing your hand to grip it comfortably and giving plenty of control. The metal-to- wood fit is of a good standard and the stock is finished with a lacquer. The chequering is laser cut, and you certainly wouldn’t struggle to lose grip of it. Bruce Sheppard, a freelance instructor, joined me on this test. On the test I decided to use the 30g Hull High Pheasant load, which is a smooth cartridge which doesn’t have a high recoil. This was to really put the inertia-operated system to the test. In my experience, the majority of inertia- operated semi-autos need at least a 32g load to bed the system in. When handing the gun over to Bruce, he was impressed with the stock measurements and how this Marocchi mounted – like most off-the-peg O/Us. 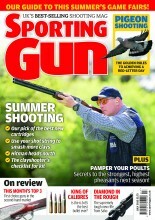 We first shot some straightforward driven clays to get a feel of it. I’m not a frequent user of semi-autos, but I found it handled well. The trigger-pull did have a lot of creep, but when snap shooting you would notice that less. Initially we found it cycled well with these lighter loads, but when we tried fired rapidly on two occasions it jammed, with an empty shell not quite extracting. I wasn’t surprised – as mentioned, these cartridges are known for their light recoil. The safety catch, magazine catch and the bolt release catch are all in a similar layout to a Benelli and all functioned well throughout the test. after shooting I found the Marocchi easy to strip, ready for a clean. Like most semi-autos, the trigger is just a simple pin to remove, allowing you to give the gun a thorough clean.